Supported by independent fiberglass poles, Feather Flags are mounted on a variety of bases in order to allow them to flutter in the breeze. All styles can be printed with stock of custom imagery for any business, group, or organization. 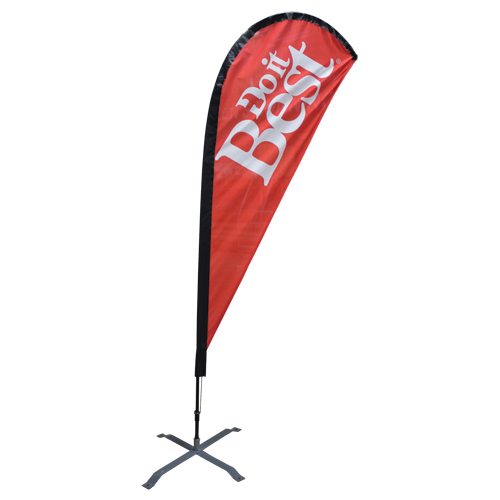 Feather Flags assemble in seconds and fit into more settings than standard flags requiring pre-installed poles. Support poles are made from assembled fiberglass, which can be taken apart between uses for easy storage and conveyance. Celina Tent has a wide range of flag anchors that let you install flags outside, indoors, in the ground, on walls and tents, and much more! 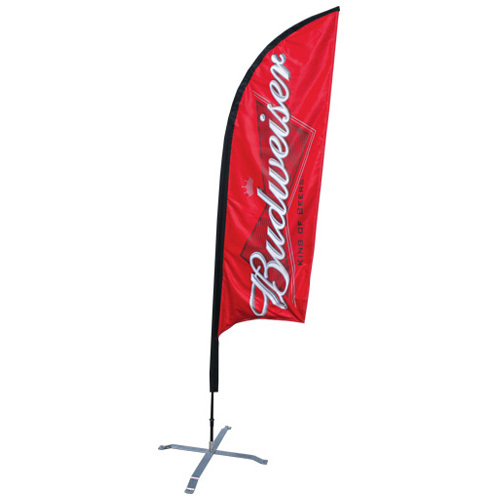 See videos on our full range of flags and products here. Due to the different shapes that Feather Flags are available in, it’s important to know exactly what kind of artwork you need printed. Templates for each style of flag – tear drop or blade – can be found on our templates page. Download the template for the shape of your choice and set up your images for a hands-on product experience! We also have a wide range of stock designs to choose from. From sales announcements to general menu items, we’ve got prints for you. The feather shape allows Feather Flags to catch even the slightest wind, creating lightly fluttering fabric that adds a festive atmosphere to each installation. Dye Sublimation printing allows flag material to be both fade resistant and machine washable for easy clean up and long finished print life. With a wide array of choices for your flag’s anchor, you can take your flag to any location and be assured of a stable base in any weather or conditions.